Gavin Tierce, lower left, waits in line with other fans at the premiere of Star Wars: The Force Awakens at Carmike East Ridge 18 theaters on Thursday, Dec. 17, 2015, in Chattanooga, Tenn. Theaters had showtimes as early as 7 p.m. for one of the biggest opening nights in movie history. 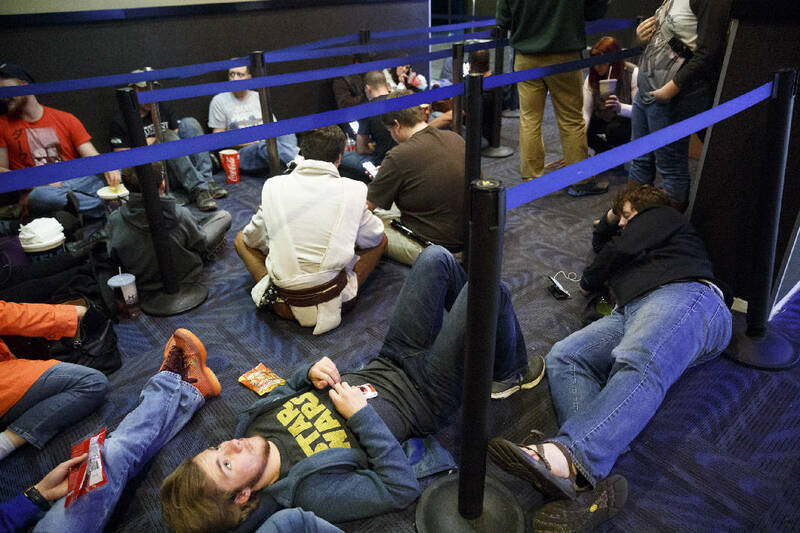 The line started at 9 a.m. Thursday, and by 5 p.m. about a hundred fans were sitting on the floor of the Carmike East Ridge 18 theater, awaiting the 7 p.m. premiere of the most-anticipated movie of the year — "Star Wars: Episode VII — The Force Awakens." Timothy Southerland, of Chatsworth, Ga., was first in line, but he had a startling admission to make: "I'm not really a Star Wars fan. I'm more of a Star Trek kind of guy." But he was holding a place for his girlfriend and his longtime buddies, Alex Dyer and Hunter Cox, all of Chatsworth, who arrived around noon. It wasn't the movie he was there to see, anyway, as it was the event he wanted to be a part of. Dyer and Cox agreed. The movie was showing in Dalton, Ga., but they'd driven to East Ridge because the crowd would be bigger and "we thought it would be more fun," they said. The Chattooines, who make regular appearances as Disney, Star Wars or other superheroes, were out in force, with costumes, lightsabers and masks. (The group's moniker is a play on the name of the planet Tattoine, series hero Luke Skywalker's home). Shellina Blevins was in costume as Princess Leia, wearing a flowing white robe and hair pulled into a bun. "I was raised on Star Wars," she said. "My dad is a fan and he made me the geek I am today." And now, she said, "he gets to experience it with me." Jade Muir Hammond wasn't with the Chattooines, but he would have fit in with his dark robe and devilish mask of Darth Maul, the Sith Lord with the deadly double-edged lightsaber. "He is an icon to me," Hammond said. "I love his light aber. He had the very best fights in the movie." Megan Thrasher, 15, and her sister Bailey, 16, were waiting for another thrill. Though they're huge Star Wars fans, they've never seen the movies in a theater — the last film in the franchise was released in 2005. "'Star Wars' is my favorite movie," Megan said. "I can't even count how many times I have seen it." For lovers of the Star Wars franchise, this is a gathering of the tribe, a chance to bond with fellow fans who have longed for this evening since Walt Disney, which now owns the rights to produce the series, announced director J.J. Abrams would be in charge. Almost all of the reviews have been positive, a big improvement over the previous three movies, which were generally panned by critics and moviegoers. The East Ridge theater is the only one in the metro area showing the movie in the 3-D IMAX format, so Thursday's shows were sold out well in advance, as was today's 7 p.m. showing. "The Force Awakens" is expected to break box-office records with profits projected at more than $1 billion, not counting millions of toys, T-shirts, posters and other paraphernalia. Two sequels already are planned, with release dates set in May 2017 and in 2019. Contact staff writer Steve Johnson at sjohn son@timesfreepress.com, 423-757-6673, on Twitter @stevejohnsontfp, and on Facebook at facebook.com/noogahealth.